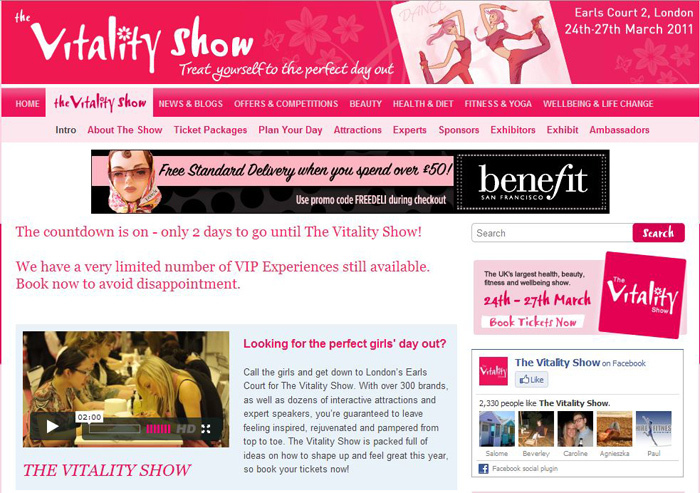 Everyone’s talking about The Vitality Show this week, one of the best ‘beauty and wellbeing’ expos on the calendar! “With over 300 companies on hand to dispense diet and healthy eating tips, beauty and anti-ageing solutions and fitness and wellbeing advice – there’s everything you could possibly want to look healthier, fitter and more gorgeous. The show is being held at Earls Court 2, London from this Thursday 24th March until Sunday 27th March. Courtesy of JustBeautyDirect, I have 4 Pairs of e-tickets for this THURSDAY to be won! For a chance to get your hands on a pair of tickets, you can either leave a comment below OR make use of Twitter! Well of course I want to go! That’s why I RT’d it!!! Wow, I’d love to go, thanks. Hi Charlotte! Can you pick me please?